DS tracks cut long for sag and will require care in fitting; somebody needs to do more research on which tank is which! There are times I wonder who's minding the store. The T-34 is a favorite subject of mine, to be sure; but when basic items are missed I do tend to get annoyed, and this kit is a typical example of somebody not paying attention. This is NOT a cast turret, which was made in several factories and generally dubbed the "gayka" or "hex nut" in Russian. All that being said, DML has done a bang-up job of getting the turret right! The tanks from both the ChKZ and UZTM were noted for having handrails fitted at the top of the hull, and later production models also had the twin cylindrical spare fuel tanks on the flanks of the hull replacing the angular ones at the rear of the hull. Strangely enough the kit only comes with one long handrail on the left side, and no spare fuel tanks of any sort. Other than that, the fittings provided in the kit match photos of the ChKZ/UZTM tanks pretty well. 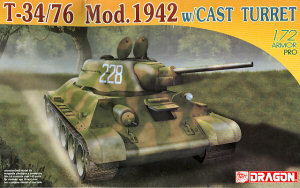 The kit comes with the same parts breakdown as other DML T-34 kits. Only one set of the very nicely done "slide molded" wheels is provided, the early production rubber tired pressed steel wheels (later ones were cast solid disks) and "waffle" tracks are provided in DML's DS plastic. A sprue of Soviet external details is included, but most of the items which were found in previous kit No. 7266 are now missing. Overall, misnomer aside, this is an excellent kit and fills another gap in the T-34 saga.